I thought it would be helpful for those with only a Haynes or Clymer manual to be able to find and download the Honda Shop Manuals and Parts Lists without having to search all over the internet for them, so I`ve uploaded the CB Shop Manuals as well as some others onto a host site so you can download them to your hard drive and print them. I`ll be adding more to this list over time so bookmark this page and check back here. As long as these get downloaded they will stay active but if a link lays dormant for more than 30 days it will disappear, so just reply here and let me know if a certain link is not working and I will fix it. I had a problem too. I've lost it now but something about Acrobat couldn't open it because it is not a supported file. Page said it was 17MB, but the download counter said it was only 9MB. Corrupt upload? YES!!! Do you have the 500/550 SB's as well??? 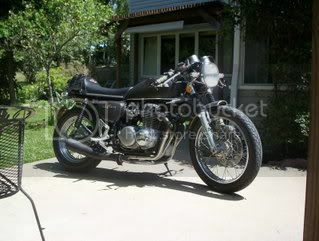 I`ve uploaded the CB750 K0-K7 and CB750 K8 F3 Shop Manuals onto a host site so you can download them to your hard drive. Nice looking 500 in your sig...what exhaust is that??? I`m going to retry the 750 manual, I`ve also added some more files at the top of page. I think all I have for the 650 is the Owners Manual. The exhaust is my own creation, the headpipes are vintage`70`s ,don`t know who made them and the muffler is a Kerker. Click next to the pic and you`ll see more of it. Still doesn't seem to be working, can't open it with acrobat or preview. All of the 550 stuff works great though, thanks! The 750 Shop Manual is now ready to download as well as the 350 - 400 manual. I`ll be adding more to these as time permits, if you have any problems downloading a certain file just post it here. If you do not have those pages, do you know anyone who does? Awesome! Thank you, good sir. No problem. I figured with the the right manual in hand anything is possible and if it keeps just one more of these old babies on the road then it`s well worth the time. I`ve added some more parts lists and manuals and will keep adding to it in the next few days,so if you don`t find what you need just keep checking back on this page. Thanks again Stephan, this stuff is awesome, keep up the good work!! the Cylmers wasn't cutting it. Thanks for putting those up Einyodeler - I hadn't seen the SOHC Service guide and the Common Service manual before. Very happy to see that all here and working! Great job Einyodeler! Great job with the manuals and Thanks. I just have one question for the group. All the versions of the 750 shop manual I have seen are missing page 132, is this page missing in the original manual?